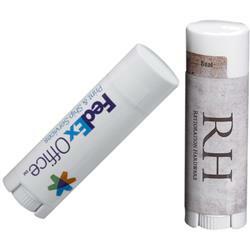 A new oval tube making this a stand out promotional lip balm. Natural beeswax based lip balm in white oval tube and your custom label. USA Made in an FDA registered facility. The 2 5/8" x 7/8" tube is made from 35% post-industrial recycled materials. Custom flavors are available at 2,500 pieces and dozens of standard lip balm flavors to choose from! Available Colors: Free full color imprint - you choose label color! Natural beeswax based lip balm in white oval tube. USA Made in an FDA registered facility. The 2 5/8" x 7/8" tube is made from 35% post-industrial recycled materials. Custom flavors are available at 2,500 pieces. Call Customer Service for more information. Up to 3 flavors at no additional cost; 250 piece minimum per flavor. Any flavors after 3 will incur a flavor change charge per flavor. Order today. Dozens of standard flavors to choose from. SPF 15 version also available.